The "Terrorism in Texas" has come to an end, thank the Lord. That awful mother of a dead U.S. soldier, Cindy Sheehan, has finally left Crawford and now President Bush can finally relax on his vacation. As I pointed out in my last entry, folks here at the White House were trying to figure out how to get that woman away from the President. It turned out charging her with prostitution, even in Texas, wouldn't work. Then Vice-President Cheney came up with a great idea. "We've got that fat-assed preacher Pat Robertson praying for vacancy on the Supreme Court," Vice-President Cheney pointed out. Perhaps you've seen the Reverend Robertson (I don't believe the term used by the Vice-President is really appropriate) on his television program praying real hard to the Lord asking that someone like Ruth Bader Ginsburg or that Souter fellow dies so their seat can be taken by a true Christian Republican. "Lord," the Reverend Robertson says, "can't you just smite a liberal judge so America can serve you better. Lord, can't you grow a giant tumor in Ruth Bader Ginsburg's head so she would have to resign. Lord, can't you have a Palestinian terrorist blow up Justice Ginsburg (while making sure no Christians are hurt). So far, Pat Robertson's prayers have not been answered although there are some in the administration who believe Sandra Day O'Connor's resignation may have been the work of the Reverend Robertson. 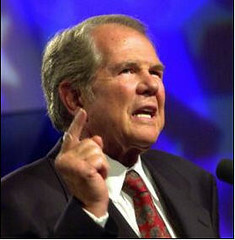 Anyway, Vice-President Cheney personally called up Pat Robertson. "Pat, you old miracle worker you. How's the prayer business going?" "I've got a few good contracts," the Rev. Robertson said. "Tom DeLay has me praying that Bill Frist become paralyzed, now that he supports stem cell research. And of course, I have the annual contract from Focus on the Family to pray that Hillary Clinton suffer from ovarian cancer." "Can you handle another prayer contract?" Vice-President Cheney asked. "For you, of course," the Rev. Robertson replied. "What do you want God to do." "I suppose you've seen that f--king Sheehan b--ch on TV terrorizing President Bush. It seems we've got no f--king legal means of getting that c--t out of Crawford. So we want you to pray to the Lord, or Allah to whoever the f--k you pray to and get that c--t out of Crawford. And make sure to tell God it's a priority." "It sounds like this could require simultaneous prayers to Jesus and God. That's ten thousand dollars an hour," the Rev. Roberston said. "Make it happen and we'll toss in a fill-up at the gas station of your choice," said the Vice-President. I guess you know the rest. Mrs. Sheehan's mother had a stroke, thanks to the work and prayer of Reverend Pat Robertson, and Mrs. Sheehan finally left Crawford. I heard President Bush broke 90 for the first time in a week. He's taken quite a few strokes off his game. Ha ha. My ribs will go down a little easier tonight. First Cindy Sheehan's mother, now Harry Reid...this Robertson guy's scary! Criticizing Steve Jobs and the Apple Mafia Autoblog is now available in Spanish . Hi, I was just blog surfing and found you! You have a great blog. If you are interested, go see my Cellulite related site. It isnt anything special but you may still find something of interest. Thank You. Your blog is one of the nicest ones I have seen in a long while, great job! Bookmarked, nice to see some decent content for a change. FYI have you seen this we've got a new feature, the 'Flag blog' button, which is inconveniently located between the 'Get Your Own Blog' and 'Next Blog' buttons so that we would presumably be getting some flags on error alone (although if one happens to notice it, you can unflag a blog). I don't know about this, what one person finds offensive is anothers cup of tea? Just my 2 cents, Tarot Readings . Hey, you have a great blog here. I have a blogging and pinging website. It pretty much covers everything about blogging and pinging. Thanks again! Dnam you get a lot of spam. Hey, I'm waiting for the robertson update. He's been talking and praying again.